The latest trend is shiny, straight hair and most of us wish to obtain that will the least fuss possible. The easiest (although somewhat time-consuming) way is with use of a hair straightener or flat iron. How you use a flat iron is crucial to the results, so it’s important to use it properly. Here, we’ll include simple instructions, plus some useful tips to help you achieve the straight-haired look you see many celebrities enjoying. 1) It’s crucial that you begin with clean hair. Wash it thoroughly and towel dry. To cut down on frizz, add some anti-frizz solution to your damp hair and use your fingers to distribute it, adding more to the ends and less at the roots. 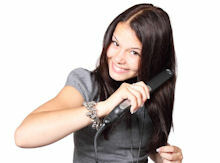 2) Blow-dry your hair on low setting until it is completely dry. If your hair dryer has a cool setting, use it. It may take longer to dry but this will also reduce frizzy hair and add shine. 3) If you have thick hair, use clips to section off your top layer(s). After the flat iron is hot, begin on the underneath layer in two-inch sections, working your way from the roots to the ends. Keep the iron moving at all times to prevent kinks. Generally, you should move the iron quicker the closer you get to the ends as they require less heat. If you desire, you can flip the ends over or under, depending on your preference. 4) Set your style with hairspray. Do not spray before you’re finished or you will get product build-up on your appliance. 5) When your flat iron is cool, clean it for the next use. Do not immerse in water. Read the instruction manual for usage and cleaning before you get started.